Argyle Feed Store is having a huge paint sale during March. If you are planning a painting project this spring, you can save big on this red dot sale. $3 a Gallon on Majic, Valspar, and Rust-oleum paint. This offer is valid March 1-31, 2018. Valspar is a wholly-owned subsidiary of The Sherwin-Williams Company. Founded in 1866, The Sherwin-Williams Company is a global leader in the manufacture, development, distribution, and sale of paints, coatings and related products to professional, industrial, commercial, and retail customers. Majic Paints is the consumer paint division for the Yenkin Majestic Paint Corporation which has been located in Columbus, Ohio since 1920. They manufacture a complete line of consumer finishes that are distributed worldwide which include oil base, acrylic, and latex paints, wood finishing products, aerosol paints, and a variety of specialty products for home, farm, and industrial use. Rust-Oleum is a manufacturer of protective paints and coatings for home and industrial use. It was founded in 1921 by Robert Fergusson (a sea captain, not the famous poet) after he noticed that raw fish oil spilled on rusty metal decks stopped corrosion from spreading. He soon incorporated whale oil into the formula, although many changes have been made over the years. 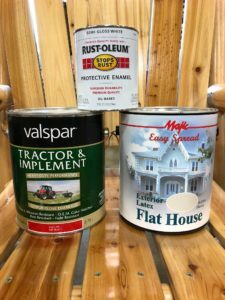 Rust-Oleum products no longer contain whale oil, instead using resins derived from Alkyds, polyurethanes, epoxys, latex, etc. Stop by Argyle Feed Store this March and save during our Paint Sale! This entry was posted on Thursday, February 15th, 2018 at 5:58 pm	and is filed under Hardware, News & Updates. You can follow any responses to this entry through the RSS 2.0 feed. Both comments and pings are currently closed.